Try out the caravaning lifestyle without the cost of buying your own van, with a hire van from HiP Caravan Hire. 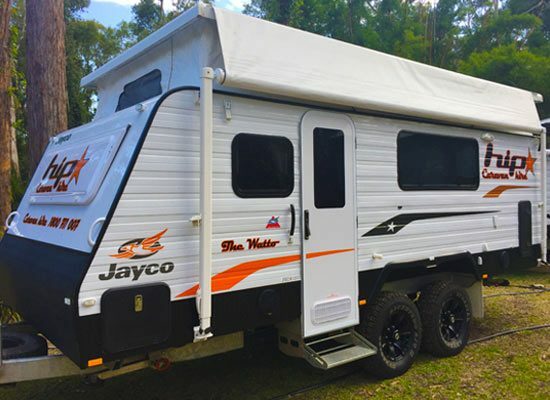 We have a massive range of Jayco hire vans to choose from, all modern and immaculate with the latest gear, you'll be on the road in no time. Based in Brisbane, you can tow the van to any destination of your choice - or have us set it up for you at a range of destinations in South East Queensland. We will offer every assistance reasonably possible throughout the hire term to support our customers on their adventure. We also offer a unique ‘route planning service’ to further enhance the customer’s HiP caravanning experience. Choose from our van styles below to get started. Hire one of our modern, reliable and luxurious Jayco vans today - they'll come with everything you need to get on the road! See our Hire Options to find out which hire type suits you best. All of the features of a full size caravan but with all of the convienence of towing a smaller lighter van. With all of the modern features of your home a full size van offers larger bedding, greater storage along with a more spacious living area. All of the features of a full size caravan but with all of the convienence of towing a smaller lighter van. The extendable bed ends of the expanda fold outwards to help create a more spacious living area. With all of the modern features of your home a full size van offers greater storage along with the extendable bed ends of the expanda folding outwards to help create a more spacious living area. Not keen to tow and setup the Van? We can do that for you! Simply advise our team of your booking location and times and we'll ensure the van is onsite and setup. The only thing you'll have to do is relax. All you need to do is collect a van, and be on your way! We have plenty of caravans and accessories to choose from to make your holiday one you'll never forget. Simply pick from our vans, collect and head anywhere in Australia you want! We've compiled a list of dream locations, all within reach with your HiP caravan! Simply make a booking for a van of your choice and select a destination, we listed a few we highly recommend.